We've come a long way since the mid-80s. Gone are the metal hair bands, jelly bracelets and bandannas—tied on anywhere (hopefully). While we all have our personal embarrassing moments from childhood, we also have the memories we want our kids to experience. The kind of memories that as the move into the toddler years, you start sharing stories that start out a lot like this, "Kid, back in my day, we used to... blah, blah, blah." Your kid proceeds to roll his eyes, tell you how lame that sounds and continue pretending that you don't exist. Just past the mid-point of Summer, it's time to think back to those favorite things you did as a kid and put a 2012 twist on them. To help get you started, below are a few of StuntDad's favorite childhood memories and how we have stunt-ified them for our little ones this summer. 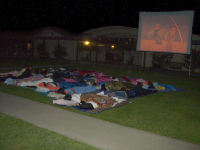 A Drive-In Movie Theater in the 80s is a Lay-Out Movie Theater in 2012: Last week, we posted a Drive-In Movie Theater (DIMT) database as a way to avoid the post-4th of July blues for your little ones. If you checked out which DIMTs are in your neighborhood, you likely were disappointed as to how many were still open. I live in the Chicago suburbs and only 1 of 20 theaters within 30 miles were still functioning. However, not is lost. While DIMTs are out, Lay-Out Movie Theaters (LMOTs) are in. Instead of exposing your children to the nearest DIMT where your nerves will be tested by the local rift-raft using illicit drugs by the water fountain, the 50 year old man in the windowless van behind you and the high school couple groping each other in the pick-up truck next to you, you have the opportunity to recreate the magic of outdoor movies in your own backyard. Thanks to the fine folks at Backyard Theater you can easily build a LOMT in the back or on the side of your house. Need a projector screen? Grab a white bed sheet. Need a projector? Buy one from Best Buy and return it within 7 days*. Need some extra cash? Spread the word to your neighbors and charge for admission, popcorn and soda. A Treehouse in the 80s is a Treehouse Waterpark in 2012: The cool kids on our block all had tree houses. 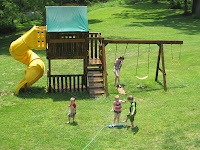 Nearly all resembled something closer to The Simpsons fort instead of Popular Mechanics, however, none of the kids fort's featured what is needed most in the summer: WATER. We've had more days with temperatures over a 100 this summer than the past decade combined. And, it's no wonder that children don't want to cramp themselves into a 10 sq foot box of wood, 10 feet above the ground. But—what if that box of wood had an overhead sprinkler system? What if the tire swing below splashed through a waterfall? What if the slide from said box of wood had running water down it? Who needs to drive to the local pool or waterpark, when you turn on your hose (or neighbor's, if they are out of town) and turn your kids loose? First step is the treehouse. If you don't have one, visit our friends at Instructables, who have some great examples of How to Build a Treehouse. Once your box of wood is ready to go, head over to Home Depot. You will need to purchase various amounts of PVC pipes & T-connectors depending on how ambitious you want to get. If you are Bob Villa-challenged, the Depot will help ya out after you explain your vision to them. Once you've identified how many pipes you need, use a 1/16" drill bit to put holes every couple inches. The more holes, the wetter your kids will get. Regardless of the number of soakage spots your fort contains, its guaranteed to have more than the next kid. PS: To make the $20-$50 back on the pipe-related purchases, take a cue from tip #1 and charge admission. 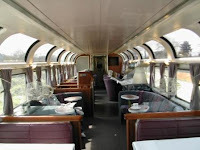 A Car-cation in the 80s is a Train-cations in 2012: The lovely drives through the rolling countryside. Dad and Mom arguing endlessly on how to get back to the main county highway. Lunches of beef jerkey, Doritors and fountain sodas from gas station Kwiki Marts. Those were the days, when we'd pile into the station wagon and pick out random cities to visit, such as Springfield, Illinois' state capital. Historic? Check. Fun? Check Minus. Not only was the city itself completely uninteresting and bleak, the 3.5 hour drive was equally dismal. And back then, the car ride south would cost about $50 in gas to get there and back. Nowadays, it would be closer to $200. Instead of spending your hard earned money on less-than-interesting vacation spots, take advantage of your local Amtrak train station. You can plan out a scenic trip, without the hassles of gas or directional arguments, to a city that you've already researched, which won't bore your children to death. And, it will likely cost you less than if you would have drove. 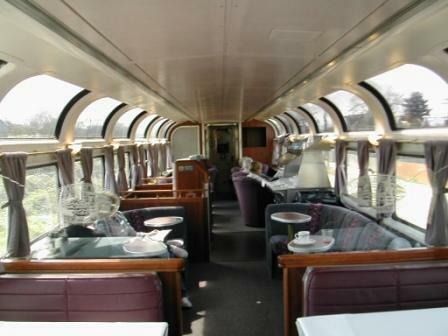 Case in point: you can take an 8-hour train ride from Chicago to the Canadian border in Michigan. International travel for less than $50 a person, with a duty free shop containing all the maple sugar and syrup a kid could ask for. 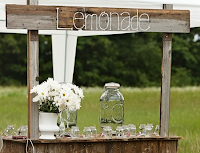 A Lemonade Stand in the 80s is a Vodka Lemonade Stand in 2012: Why should kids have all the fun? Here is an idea to make the entire family happy. Tell wifey you will be spending the afternoon in the garage constructing a homemade lemonade stand for the kiddies. She will think you are incredibly thoughtful and you will get to spend a few hours with power tools, beer and solitude. The result: by day, the kids get to spend the afternoon in front of your house selling dixie cups of lemonade for 25 cents. By night, the dixie cups are replaced with shotglasses and you get to spend the evening in front of your house selling shots of vodka lemonade for $2 to the local parents. Your kids will think you are the best dad in the world by selling their lemonade after they've gone to sleep, your neighborhood parents will appreciate a quick summer evening buzz and even your wife will think more of you than just the guys who sleeps in the same bed as her. Hell, you might even get a little nookie out of this. *Successful attempt by Stunt Pete on July 4th of this year. Projector returned to Best Buy in its original packaging on July 8th, no questions asked! How do you take your childhood memories and 2.0 them for your kid? Pin It Now!